This listing is for 20 Bun in the Oven Cinnamon Roll Soap Party Favors perfect for baby showers. WHAT'S INCLUDED IN THE PRICE? 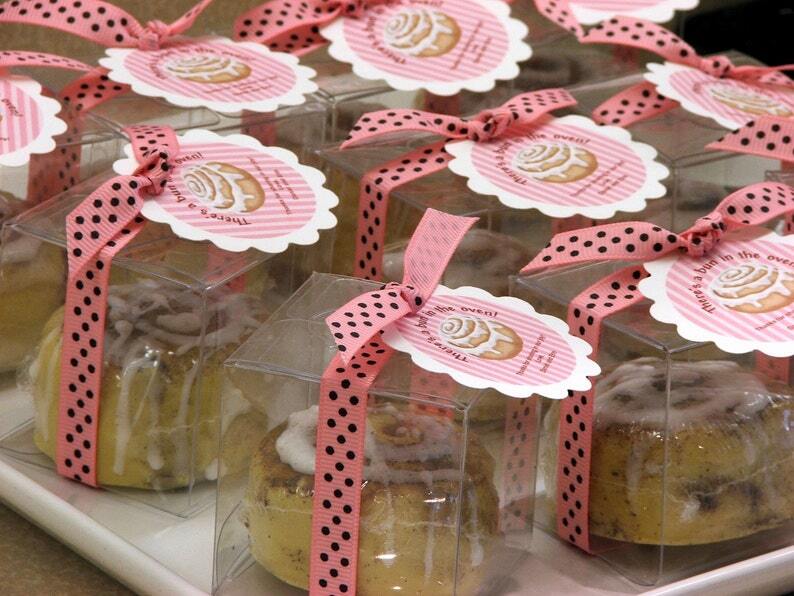 You will receive 20 individually packaged cinnamon bun soaps. These measure about 2" across and are about 1 1/2" tall. Each weighs a little more than 2 oz. Each party favor will be shrink wrapped and packaged in a clear box with ribbon and tag which may be customized. For boys - There's a bun in the oven Ready to Roll! For girls - There's a bun in the oven Oh So Sweet! Not sure - There's a bun in the oven! If you choose the not sure tag - we can also add one line of text for example..."Thanks for sharing in our joy! Bob & Shawna"
We can also work with you with you on tag color background and ribbon color. Need a different quantity - send a convo. Did you know that by law we are required to include on each soap favor the soap scent, ingredients and our contact information? This information will be printed on the backside of each favor tag so your guests will know the favor is soap and all of the goodness inside! Not only do these look adorable, but each soap is made from our luscious lather shea butter moisturizing soap base and will leave you skin soft and moisturized. 1) Party Date so we can time these to arrive in plenty of time. 2)Tag Preference and message if any - Indicate Boy (Blue Tag) Girl (Pink Tag) Don't Know (Gender Neutral Green or Yellow Tag. Ingredients: Coconut oil, palm oil, safflower oil, glycerin, shea butter, purified water, sodium hydroxide, sorbitol, sorbitan oleate, soy bean protein, titanium dioxide, micas, cinnamon, fragrance oil.